The Grand Pavilion was opened in 1932 and is well known for its octagonal dome and striking frontage on the Porthcawl seafront. Originally intended as a Palm Court for hosting tea dances, balls and civic functions, the Pavilion is a multifunctional venue, hosting a wide variety of events throughout the year including live theatre, concerts, ballroom dancing, conferences, dances, and culminating in the ever-popular Christmas pantomime. The Grand Pavilion is also a versatile and unique conference venue, hosting many corporate and charity conferences and meetings, and is a popular location for civil wedding ceremonies, receptions and parties. Visitors to the Grand Pavilion’s café bar enjoy panoramic south facing views across the Bristol Channel. The café bar hosts its own series of events including jazz, literary talks and an art forum. The Grand Pavilion is run by a team dedicated to making your visit a memorable one. Please take a look at What’s On and keep attending to be inspired by the arts and experience the thrill of live theatre.Agorwyd Pafiliwn y Grand yn 1932 a mae’n hysbys am ei gromen wythonglog ar lan y môr ym Mhorthcawl. Wedi’i fwriadau’n wreiddiol fel Palm Court [Cwrt Palmwydd] ar gyfer cynnal dawnsfeydd te, dawnsfeydd mawr a digwyddiadau sifig, mae’r Pafiliwn yn lleoliad aml-bwrpas, yn cynnal amrywiaeth mawr o ddigwyddiadau trwy gydol y flwyddyn, yn cynnwys theatr fyw, cyngherddau, dawnsfeydd ystafell ddawnsio, cynadleddau, dawnsfeydd eraill, ac yn diweddu yn y pantomeim Nadolig byth-boblogaidd. Hefyd mae Pafiliwn y Grand yn lleoliad hyblyg ac unigryw ar gyfer cynadleddau, yn cynnal llawer o gynadleddau a chyfarfodydd corfforaethol ac elusennol, a mae’n lleoliad poblogaidd ar gyfer seremonïau priodasau sifil, derbyniadau a phartïon. Rhedir Pafiliwn y Grand gan dîm wedi’i ymroddi i sicrhau bod eich ymweliad yn un cofiadwy. Edrychwch ar Beth sydd Ymlaen a daliwch i fynychu i gael eich ysbrydoli gan y celfyddydau a phrofi ias theatr fyw. The Grand Pavilion is Porthcawl’s ‘Jewel-in-the-Crown’. When it was built and opened in 1932, modernity was considered to be the keynote of its architecture. The most significant feature was the large octagonal concrete dome directly surmounting the main auditorium and concert hall. A Grade II listed building since 1998, the dome is a classic example of the early application of ferrous concrete (Ferrocrete) in building construction. In 1957 a US Government travel ban prevented Paul Robeson the famous US actor, singer and Civil Rights Movement leader from appearing in person at the Porthcawl Miners’ Eisteddfod, however he still performed live via a secretly arranged two-way transatlantic telephone link up, where he thrilled a capacity audience with his singing. In 2007, the Grand Pavilion celebrated this important event with a very special concert featuring Sir Willard White. Over the years The Grand Pavilion has been a magnet for entertainment and has attracted a cavalcade of many well-known artistes and shows to its doors. In the days of the big bands, famous orchestras performed to a packed dance floor and many a budding romance developed into a long-term marriage. 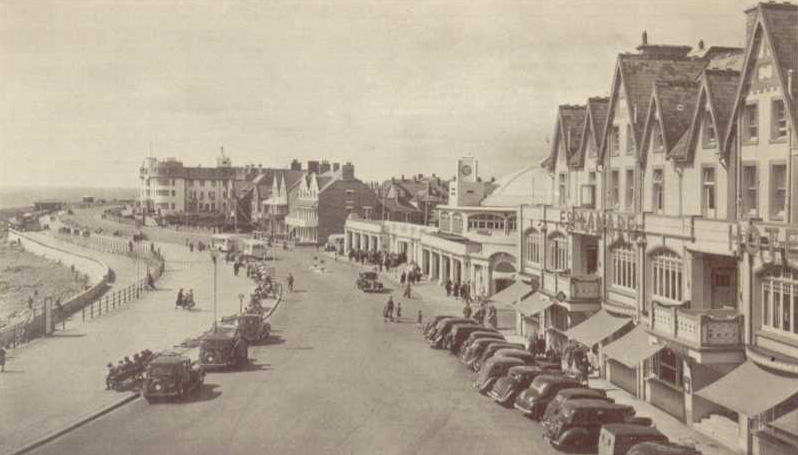 It has been home to concerts, recitals, operettas, ballet, boxing and wrestling contests, conferences, talent competitions, beauty contests, pantomimes, summer shows and all-important Miners’ Eisteddfod. With thanks to Keith E Morgan for his permission to use this excerpt from his book ‘The Grand Pavilion Porthcawl’. Copies are available to buy from the Box Office and other booksellers.